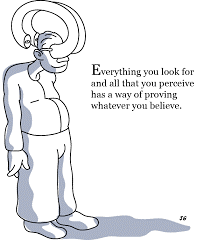 Confirmation bias is the tendency to seek, interpret and record information that confirms our preconceptions. It happens when people give more weight to evidence that confirms their hypothesis and undervalues evidence that can disprove it. Facts rarely have a chance to be recognized when up against the power of our beliefs. So it makes reasonable sense that the opposite may be true. When we have a strong negative belief about someone, such as your former spouse or in-laws, we are likely to mentally record only the facts that will confirm our belief. (Humans really love to feel right!) For example, you are anxious that your child’s adolescent sloppiness indicates they will grow up to be a “slob.” In believing this, you will only see when they are lazy, careless, sloppy etc… The times when your child is careful and responsible may be missed if your negative beliefs and expectations are strong enough. Now consider the adult you have strong negative feelings about. It may be a sibling, a neighbour or even your co-parent. Your negative beliefs will lead you to notice only the moments that will confirm your belief. If you believe someone is selfish then that is all you will record. If you believe someone is insensitive you will not notice when they are indeed emphatic. If you believe they are out to ruin you then you will mentally record anything that looks like aggression and completely ignore when their behavior is not in line with your belief. In a conflicted divorce, adults feel anxious to protect themselves. They become very protective of their negative beliefs about their co-parent much like the person in-love. They will resist anyone pointing out any discrepancies. This creates more “always and never” comments and thoughts. “He is a complete control freak!” “She is never flexible with the schedule.” As a result they will not notice when the other parent is reasonable (albeit- rarely but none the less it will be missed). For your sake and your child’s, consider you may be caught up in your own confirmation bias about the other parent which is not helpful to being reasonable or appreciative. It will not help you develop a more cooperative relationship. Make a serious effort to be aware of the exception or the opposite of what you believe and expect. These three steps will help you make a conscious effort to put on new glasses that may allow new information to be processed in your brain. Furthermore, your child will not have to play devil’s advocate to point out the positives and convenience you of a truth you cannot see. In other words learn to seek the exceptions to your belief and enjoy the rare occasions when they occur.